We at the Dunkirk Animal Clinic strive to provide the best quality medicine for your pet. This includes not only services provided during our open hours, but after hours services as well. Due to circumstances beyond our control, the Doctors have decided that it is in our and our patient’s best interest to no longer provide after hours emergency services and phone consultations. We do not have after hours staffing available and we feel that your pets will be best served in an emergency situation at the Orchard Park Veterinary Medical 24 hour care center. They are available after hours 24/7 to answer any questions or concerns you may have about your pet. They can be reached at 716-662-6660. Check out their website www.opvmc.com. As always we open at 8 am M-S and are still available to see emergencies during regular business hours. Our goal at the Dunkirk Animal Clinic is to provide the highest quality medical care for your pet. In order to do so we have implemented a tight appointment schedule to get all our patients seen in a timely manner. Our increasingly busy schedule has forced us to effectuate a new appointment policy (Cancellations, Late Arrivals and “No-Shows”) which can be viewed on our website page “Appointments and Policies” under the “Services” menu item. Please note that our “no-show” policy now includes a $20 “no-show” fee unless you call and give notice by the morning of your appointment. If your dog suffers from noise-induced fear and anxiety, we have a new prescription product that may help! Sileo ® is the first and only FDA-approved treatment for dog that suffer from fear and anxiety associated with noise events like fireworks, thunder, construction work, street noises and traffic. It’s an easy to give oral gel medication admisnistered by syringe between the cheek and gum. Sileo ® is formulated to provide a low dose of dexmedetomidine, which alleviates noise induced stress while allowing your dog to remain fully functional. Gives us a call at 716-366-7440 and let us help your anxious dog. Sileo ®can offer some relief!! As springtime arrives so do some pesky parasites that we want to keep away from our beloved pets. Fleas, ticks, mosquitoes, among others can pose serious problems – from a minor annoyance to a major health issue – to both our dogs and cats, and yes even to us. We carry a wide range of products to protect your pets from seasonal and non-seasonal parasites. We offer topicals, ingestibles and wearables, each have an advantage to suit your needs. Do you like your tried and true topical that you use every year? We have Advantage-Multi and Activyl that you apply topically once a month. Don’t prefer a topical or can’t remember to apply it every month? We have Bravecto chews for fleas and ticks that last up to 12 weeks (for dogs only). Don’t want to have to remember to treat a pet more than once? We carry Seresto collars that can last up to 8 months for both dogs and cats. Unsure of which to use? Call us and we can help you choose what’s right for you and your pet’s lifestyle. For heartworm protection we have Sentinel (chews for dogs) and Advantage-Multi (cats). Remember, before you can pick up heartworm preventative for this season, your dog will need to be tested first. If your dog has been on a heartworm prevented all year round, then we require a heartworm test every other year. Whether your pet is rehabilitating from trauma or injury, healing from wounds, or developing arthritis from aging, your companion can benefit from this innovative approach to treating pain. Visit our laser therapy webpage for more information or, if you think that your pet would benefit from laser therapy, call us at 716-366-7440 to schedule a consultation. 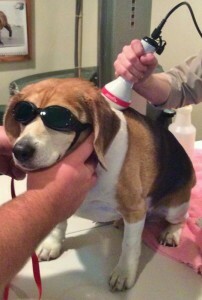 Your can also check out Dr. Frost’s May Observer Today article “Laser Therapy for Pets“. Dunkirk Animal Clinic now has an Online Store! 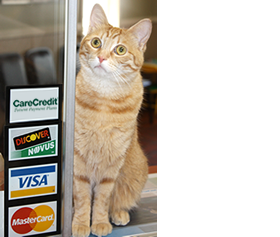 Now you can order prescription refills, food, and other items for your pet directly from us on the internet, at any time of night or day, for delivery right to your doorstep. Buying pet-related products from our practice is easy, convenient and secure, and you can rest assured that these products come from a reliable and trusted source. Click on the “Pet Portal LOG IN” link in the upper right corner of our website. Once you log in, click the “Shop Online” menu tab to get started.